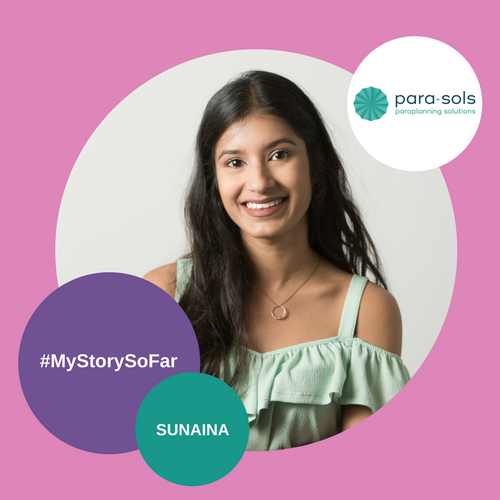 I’m Sunaina, (or Nains), and I joined The Grad Scheme at Para-Sols in July 2017, straight out of Nottingham Trent University where I studied English and Linguistics. When I first started here at The Grad Scheme I didn’t really have much of an idea about all things finance and paraplanning so it wasn’t something that had ever sprung to mind as a career choice for me. Despite that though, there was something about the opportunity that made me want to get involved. Since starting here, my confidence has improved majorly in regards to answering / making phone calls. I used to be really scared to talk to providers and advisers but I’ve realised it’s not so bad! I’m also much more confident within myself and how I approach my work – the support you get from everyone here makes it really easy to come out of your shell and be a more forward-thinking person. The best thing about working here is definitely the people. Everyone is just so lovely and we genuinely all get on really well as a team. There are places where people just ‘put up with each other’ at work because they have no choice, but here, that isn’t the case at all. There is a real sense of team spirit in the office and there’s always someone to help you whenever you get stuck. I love how we do ‘team-building’ activities too, for example, we’ve just set up a weekly running club on a Monday night! (The snack cupboard also adds to the enjoyment of working here). In my time here so far, I have noticed that one of the main qualities you need to be part of The Grad Scheme is the ability to be yourself – your personality needs to stand out! You also have to be able to get on with your colleagues and work as a team, that is a must here. Of course, your skills matter too; strong writing skills and having an eye for detail are both important. You also need to react well under pressure, as it does get busy – that’s why it’s so important for everyone to get along, because sometimes you really do rely on each other for support within your work. Since leaving uni and starting at The Grad Scheme, I already feel as though my career is progressing. I didn’t really have a clue what I wanted to do initially after leaving uni, but now I have a goal in mind and Para-Sols has really brought this out of me. I now know how I can develop as a person and work my way up within the company.